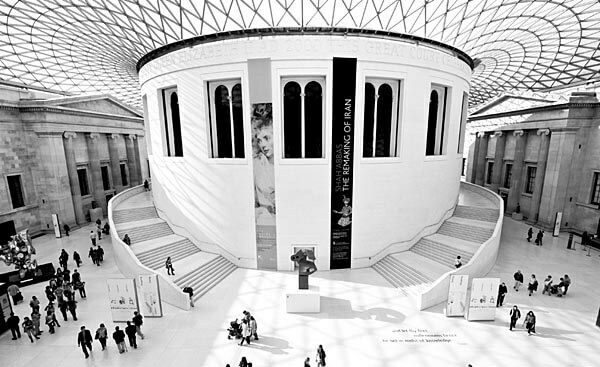 Located in the Bloomsbury District of London, The British Museum was founded by King George II in 1753. It was a collection of cultural art objects and antiquities bequeathed to him by Sir Hans Sloane in and consisted of approximately seventy thousand artifacts, books and specimens of natural history. Today the museum consists of seven million objects! Opened to the public in 1759, it was first located in the late 17th Century Montagu House which was on the site of the present museum building. Over the following centuries, it was expanded many times by the purchase and acquisition of 69 houses around it. In the late 18th Century, the museum’s notable antiquities began to arrive. Sir William Hamilton, a member of Parliament , antiquarian, archaeologist and British Ambassador to the Kingdom of Naples sold the museum his collection of Greek vases and other Greek and Roman artifacts. Captain James Cook and other explorers brought back objects from their South Sea voyages, while Clayton Mordaunt Cracherode, an English book and old master print collector, bequeathed the museum his engraved gems, coins, prints and drawings collection. Today the museum’s natural history collections are at the Natural History Museum in South Kensington and the books and manuscripts are at the British Library in St. Pancras. Among other artifacts, the museum’s department of ancient Egypt and Sudan contains the Rosetta Stone and Cleopatra’s mummy; the department of Greek and Roman antiquities contains the Elgin Marbles from the Acropolis, along with the Mausoleum of Halikarnassos and Temple of Artemis, each of which are one of the Seven Wonders of the Ancient World. Other departments are the Middle East, Prints and Drawings, Asia, Department of Africa, Oceania and the Americas, Coins and Medals, Prehistory and Europe, Conservation and Scientific Research, Libraries and Archives, and the British Museum Press. For the convenience of visitors there are three eating places and a picnic area. The Court Restaurant, beautifully set under a glass roof, offers lunch, afternoon tea and dinner that includes many European classic dishes. The family friendly Gallery Café offers either light snacks or hot meals. Two Court Cafés offer sandwiches, salads and light meals. There are four museum shops, including a book shop, souvenir shop, culture shop for luxury items and replicas and a family shop offering children’s puzzles and games, DVD’s and educational items. 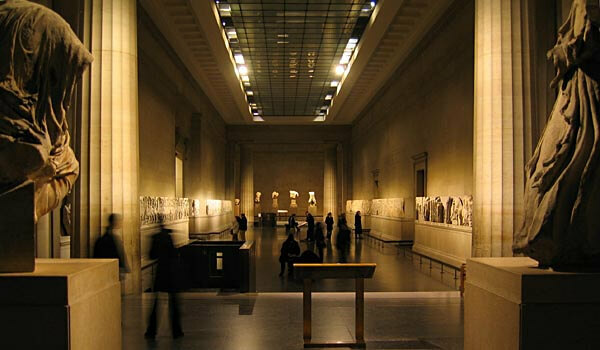 One of the world’s largest museums, the British Museum covers seventy five thousand meters of exhibition space, with artifacts within representing the world’s cultures from the ancient to the modern. One hundred galleries are open and free to the public. Last updated by Ginny on 20 November, 2011 in Destinations.